Faced with white brick lined with red Lake Superior sandstone, Superior’s State Normal School, founded in 1893, was built on land donated by the Land and River Improvement Company. A wing was added to the building in 1908, and a second addition was made in 1912. Crownhart Hall, a women’s dorm, was built in 1910. Unfortunately the main building burned in 1914; a new building took its place in 1915. The school’s name had changed from State Normal School to State Teacher’s College by 1927. 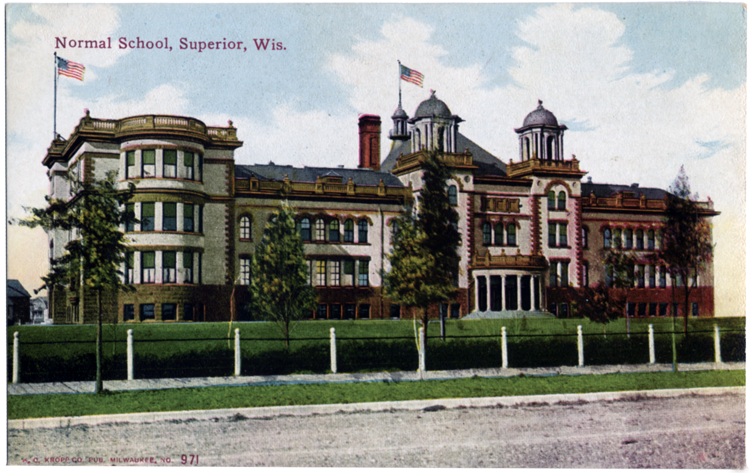 The main building, called “Old Main,” survives as part of the University of Wisconsin Superior. The original Crownhart Hall was torn down and replaced by a more modern dorm building in the late 1960s. The school’s first class, made up of nine women and three men, graduated in 1897. Perhaps the school’s most famous alumnus is famed body builder, movie star, Kennedy in-law, and former California governor: Arnold Schwarzenegger.